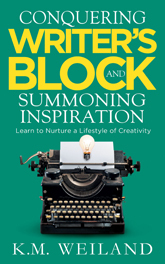 Position yourself to live an inspired life and send the dreaded writer’s block packing. "Exhorts writers to celebrate their innate creativity and gives tips on how to access that creativity rather than waiting for it to come to you. K.M. gives easily understood ideas and peppers her own experience with quotes from well-known authors talking about similar issues." "K.M. Weiland just released ... Conquering Writer's Block and Summoning Inspiration. She breaks down topics into bite-sized, easy-to-swallow pieces. She understands our joys, fears and frustrations, and offers practical tips on how we can become better writers." "[Weiland] gives a concise but well-designed course to make yourself more creative and productive. Tracks include how to have ideas, the myth of the writing zone and how you can be productive every time you sit at your keyboard. How good old-fashioned handwriting can help your ideas flow better than typing on your shiny laptop. How to work through an idea when you’re stuck. How to be productive even if you have little writing time."